Coronary artery disease (CAD) worries most health-conscious adults since it is so common and so deadly yet so silent. The narrowing of the heart arteries (coronary arteries) can start as early as childhood, develop into advanced lesions by 25 years of age but only become symptomatic by the 50s or 60s. You can literally go decades without knowing that your risk of having a heart attack or developing heart muscle disease is gradually increasing. And when the consequences strike, it does so sometimes with no prior warning and death can be quick. Testing is crucial in diagnosing coronary artery disease. It can vary from a stress EKG to imaging studies that allow your doctor to visualize the narrowing in the coronary artery. The proper diagnostic investigations can identify coronary artery disease early and possibly save your life. However, routine screening may not be accessible to every person. There some people should consider it more so than others depending on their risk profile. And any adult with symptoms have the necessary tests done without delay. Today coronary artery disease (CAD) and associated complications are the number one killer in the United States. There is no way of knowing for sure just how many Americans are walking around with coronary artery disease. Until the symptoms develop, most people are completely unaware of the ticking time bomb in their heart. It is estimated that about 36% of the American population has cardiovascular diseases but less than half of those are diagnosed annually. Coronary artery disease, also known as coronary heart disease or ischemic heart disease, is a condition affecting the arteries that supply oxygen- and nutrient-rich blood to the heart. These arteries are known as the coronary arteries. There is right and left coronary artery which in turn divides into branches. In coronary artery disease, these arteries become narrowed by the formation of fatty plaques in the artery wall. This process is known as atherosclerosis. The plaques become hard and partially block the blood flow to the heart muscle. Sometimes the narrowed artery can become suddenly blocked by a clot thereby cutting off blood flow to a portion of the heart muscle entirely. This is known as a heart attack or acute myocardial infarction. 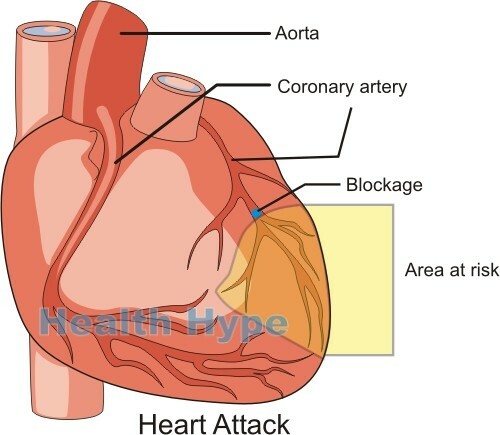 Even if a heart attack does not occur, the restricted blood supply gradually damages the heart muscle and a condition known as cardiomyopathy arises. But there are also other cardiac consequences of coronary artery disease. The fact is that CAD is a killer. Previously diagnosed with coronary artery disease. Excessive alcohol consumption on a regular basis. There are other risk factors but these are the most serious by far. Routine screening can be helpful as well as dietary and lifestyle modification. The problem is that most of us wait for the symptoms to appear and be intense before we even consider seeking medical attention. But even if you do not have symptoms there are still some indicators that you may be at very high risk of coronary artery disease. During physical exertion or stress, the heart rate increases and the heart therefore needs more blood. While chest pain in coronary artery disease can occur on its own without any stress and even while you are resting, the vast majority of cases are triggered by physical activity or psychological stress. It is known as angina pectoris and it is the pain resulting from the heart muscle receiving insufficient blood for its needs. Not all types of angina are due to coronary artery disease but it is one of the common symptoms of CAD. It is often described as a crushing or constricting pain in the center of the chest and is one of the definitive signs of a heart problem. We all get short of breath if we strain ourselves. It happens faster for some people than for others and this is largely due to physical conditioning of the individual. But with coronary artery disease that is severe enough to be symptomatic, you may find that you are short of breath even with mild activity that was never a problem in the past. Rapid breathing usually starts up. It is a result of the heart not getting enough oxygen in the blood and signaling the brain to increase respiration to acquire more oxygen. 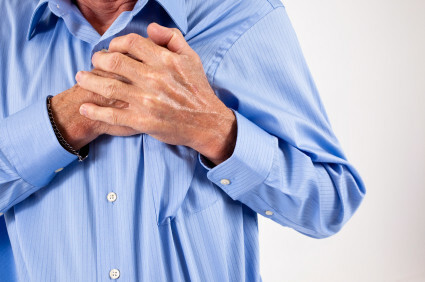 However, shortness of breath is not only due to coronary artery disease. It can be a symptom of many other diseases and should be assessed by a doctor. Excessive sweating that arises suddenly is another characteristic cardiac-related symptom. However, it is important to differentiate sweating due to hot weather from unexplained sweating. Remember that perspiration is part of the human thermoregulatory system. Simply this means that we sweat to cool down. So if you are in a hot climate or have undertaken strenuous physical activity, you will sweat and this is normal. As a heart disease symptom, the sweating comes on suddenly and is profuse. Despite sitting in a cool room, the sweating may continue. However, sweating alone should not be considered as a sign of coronary artery disease. It should correlate with other symptoms. These are two common but non-specific symptoms that may or may not be related to cardiac problems. Nausea is the feeling that you want to vomit. Indigestion is a collection of symptoms such as nausea, a bloated feeling, burning and/or discomfort in the abdomen. Nausea tends to accompany cardiac problems but other heart-related symptoms are sometimes mistaken for indigestion. It is not entirely uncommon for a person who has a heart attack to report no specific cardiac symptoms in the weeks or months prior, except for indigestion and heartburn. It may not be related to digestion but was entirely cardiac symptoms masked as the digestive symptoms. Sometimes angina presents as heartburn rather than the characteristic constricting pain in the chest. We all feel tired after a long day or without having a good night’s sleep. This is normal and easily remedied with rest. However, fatigue is extreme tiredness that does not correlate to physical strain, mental/emotional stress or sleeping patterns. It is also not easily remedied with rest. Fatigue is a non-specific symptom that occurs with many diseases apart from cardiac problems. Dizziness in cardiac disease arises with insufficient oxygen supply to the brain as the heart strains to pump blood adequately. It can come on with the same triggers of angina and shortness of breath but often eases quickly with rest. Sometimes the oxygen restriction can be severe enough to lead to fainting.